Outrage has followed a proposal by oil company UKOG to impose a High Court injunction preventing various protesting actions at its West Sussex sites. The injunction, to be put before the High Court on Monday, would cover slow-walking, lock-ons and lorry-surfing, all of which have occurred at UKOG’s Broadford Bridge site near Billingshurst. UKOG has said the ‘serious legal action’ was to protect against unlawful conduct from activists and did not prevent the right to freedom of expression and assembly. But campaign groups and political parties were quick to condemn the injunction proposal as undemocratic ‘draconian’ and a restriction on the right to peaceful protest. Broadford Bridge Action Group said: “This attempted action by UKOG is an affront to democracy. UKOG currently operates three sites in West Sussex and has said it has no plans to use hydraulic fracturing or ‘fracking’. Flow testing at Broadford Bridge includes acidisation, which UKOG has consistently defended as a conventional drilling practice. Campaign group Markwells Wood Watch, which protested against a similar application from UKOG to drill in Stoughton, has appealed to its supporters for named defendants to challenge UKOG at the court hearing. Balcombe resident Kathryn McWhirter said communities had a right to protest against damage to the landscape. She said: “Local communities feel bullied and oppressed, by our government and by the oil and gas companies. 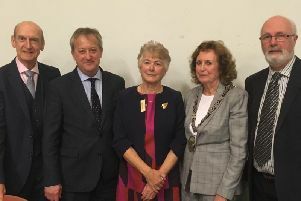 Arundel and South Downs constituency Labour Party passed an emergency resolution on Saturday to condemn the injunction idea and support campaigners in the fight against ‘industrialising the countryside’. Green MEP Keith Taylor said the injunction would be ‘draconian’. He said: “In a free and democratic country, a company’s economic interests should never supplant citizens’ fundamental human rights. A spokesman for UKOG said: “Recent incidents have compelled UKOG to take this serious legal action to protect itself, its supply chain and landlords from threats and unlawful conduct from activists, who are intent on preventing us from going about our lawful business. “The injunction does not prevent anyone effectively exercising their rights to freedom of assembly and freedom of expression.